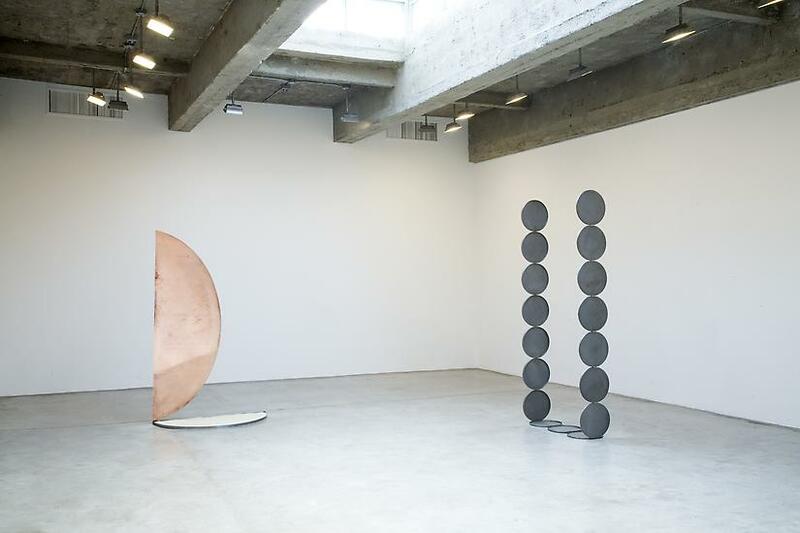 Tanya Bonakdar Gallery is very pleased to present Doors and Bouncers, an exhibition of new sculpture and collage by Nicole Wermers and the artist’s first solo exhibition in the US. These new pieces fuse formal aspects of modernism with the glamorously superficial aesthetics of consumer culture, furthering Wermers’ investigation of the corporate strategies that shape society’s behavior. Repositioning the visually seductive language of design, advertising and architecture within an elegant modernist aesthetic, Wermers uses the vernacular associated with commerce to comment on Western culture’s obsessions and desires. Thresholds and doorways, especially those found in commercial contexts, are particularly important to Wermers’ interest in and analysis of the contemporary landscape. 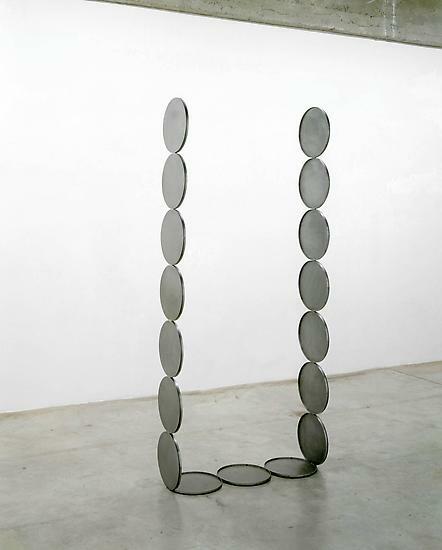 Her iconic piece, Untitled 2004, draws inspiration from a shoplifting detector, and ashtrays in corporate lobbies served as a point of departure for her 2002 series French Junkies. 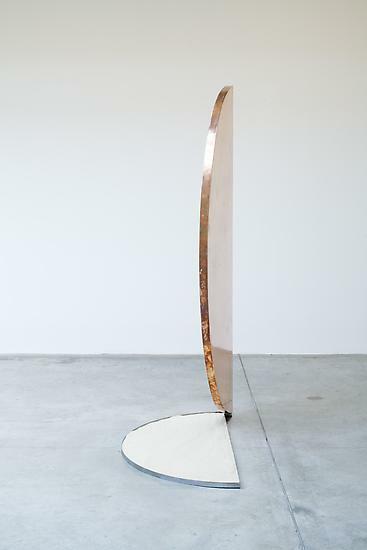 The sculptures presented in Doors and Bouncers also reference doorways as sites rich with meaning, these new works however, suggest a more spiritual, advanced or futuristic interpretation of what might lie beyond the transitional space of an entry or exit. By removing the doorway from its functional architectural context, Wermers’ implies a metaphorical as well as physical passage. 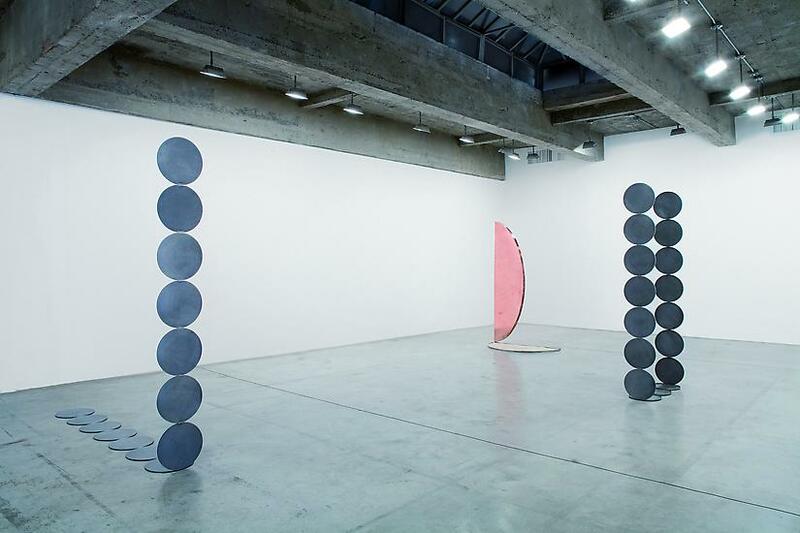 These new sculptures are evocative of portals between dimensions, or periods of time, serving as a jump cut might in a film. Seducing the viewer they suggest the potential for transportation to a realm beyond the present reality. 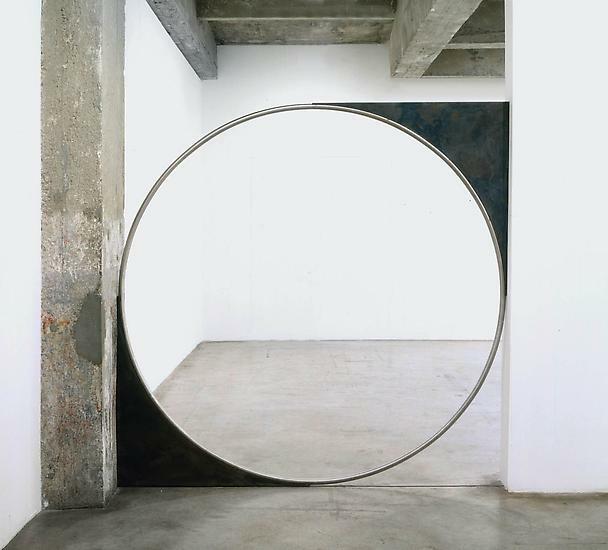 The first of the Untitled Forcefield sculptures encountered is a patinated steel ring installed between the main gallery and the entryway. The works fits neatly into the gap between the structural concrete wall of the building and the interior gallery wall, simultaneously dividing and uniting the two spaces. 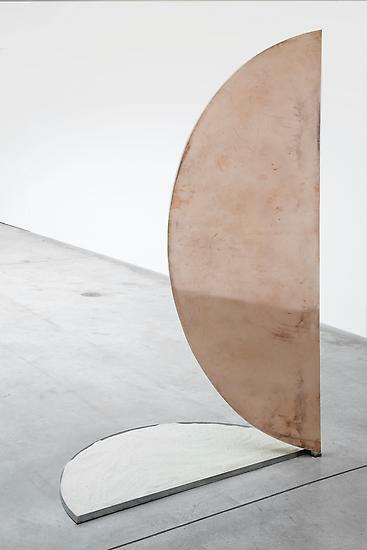 Through the steel ring, passing onto the main gallery space, a copper half disk balances on its end, evoking a rotating or revolving door. 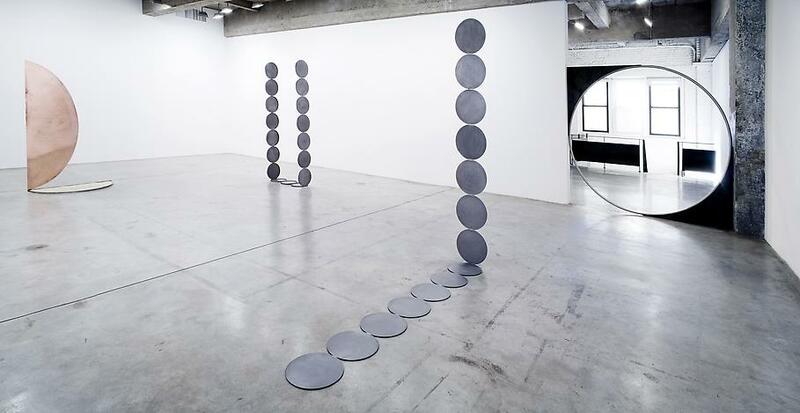 Nearby two sculptures comprised of a string of discs reference Carl Andre, as well as representing thresholds to other realms. Each Untitled Forcefield has an energy and allure, but their significance remains elusive. 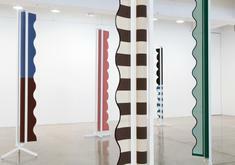 From varying view points the works, or elements of them look like flat geometric cut-outs, not quite delivering the volume they promise from other perspectives; what initially looks like a door, or point of access from one perspective can conversely be an obstacle or “bouncer” from another. 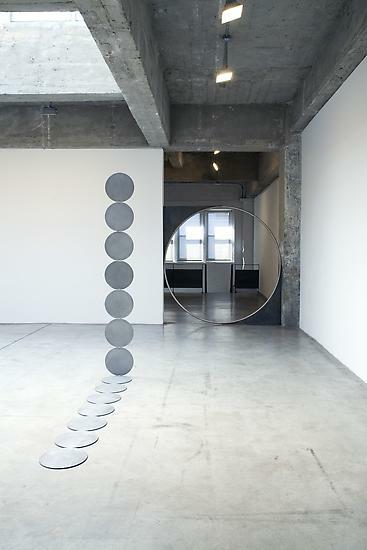 Vanishing as much as they exhibit themselves, the sculptures are positioned both formally and thematically in a nebulous gray area between visible and invisible, accessible and inaccessible. The same ambiguous dimensionality, and fusion of figuration and abstraction within the sculptures is evident in a grouping of collages installed in the side gallery. Comprised of figurative elements from fashion, architecture, and interior design magazines that are used to sell products, communicate emotion, lifestyle choice and status, the works maintain the original portrait format and small scale given by the source material, but depict abstract, seemingly three-dimensional objects.